December is in full force and your students are starting to get lost among dreams of sugarplums dancing in their heads. It is also a time when teachers may need to think about creative craft projects for their class to make, either for gifts or just because the semester’s material is almost completed. Creative expression is fun for your students, but if designed correctly, it can also be used to further your students’ language skills. These holiday crafts do just that as they take advantage of one of December’s most popular traditions. One activity that many people participate in as the year comes to a close is sending greeting cards to their friends and family. In today’s world, many people have so many things going on in their lives that the yearend holidays are a good excuse to get in touch with people they may not have talked to all year! Most do this with greeting cards. To start the unit, bring in a collection of greeting cards for your students to preview. You may choose to bring cards that represent several different occasions or keep your examples within the holiday card genre. Challenge your students to note some similarities and differences among the cards. Some cards may be written in verse, others in pros. Some may mention specific holiday and others give more general greetings. Ask your students to come up with some people to whom they might like to send a holiday card. They may list family, friends, famous individuals or people they do not know such as volunteers serving in the military. After each person has a list, ask him or her to choose one person from that list to send a special, individualized holiday card. Then it is time to get out the leftover art supplies that you have been collecting throughout the year and let your students’ creativity flow! You should have different colors of card stock, fabric scraps, glitter, glue, construction paper, paint, markers and any other supplies you have available in your art closet. Encourage your students to be creative in decorating the front of the card and the inside if desired. Make sure your students understand that they should write an original message inside the card. It is best to write a rough draft on another piece of paper first before putting the final version in the card. Once the art portion of the card is complete, each person should write the final message inside the card. If you like, provide envelopes for your students and teach them how to address the envelope to it recipient in preparation for mailing. Every year, the post office sells postage stamps designed for the holiday season. There is generally a religious themed stamps as well as a non-religious stamps, and most people use them to mail their holiday cards. Since your students have already designed and created individualized holiday cards, challenge them to design a postage stamp that anyone might use to mail their holiday cards. You can have each person design the stamp on a standard piece of paper using crayons, pencils or markers. After each person has drawn his stamp, he may want to perforate the edges with a hand held hole puncher so it better resembles a stamp. You can then display the stamps on a bulletin board in your classroom titled “We’re Going Places”. If you choose to do so, you can take digital pictures of your students’ stamp designs which can be used to print custom postage stamps. There are several web sites (including zazzle.com and stamps.com) licensed by the U.S. Post Office that will take your uploaded image and create legal postage stamps that can be used in the U.S. mail. You may want to have your students read the FAQ about photo stamps before they design their own. Once all the designs are done, you can order these stamps yourself or e-mail the digital images to your students’ parents with an explanation and a link to a site where they can order stamps for themselves. If anyone does order stamps based off his design, ask that he bring in one of the stamps for the class to see. Now that your class has created their own cards and thought about how to mail them, it is time to think about the cards they will receive. Many people display the holiday cards which they receive in their home as decoration. You can create a greeting card holder for your classroom that can serve as both a card display and a reading center for your students’ free time. To make a card display that looks like an evergreen wreath, have each student in your classroom paint one or more spring loaded clothespins green, in one of two shades of green. You will need a total of forty-two clothespins for the wreath, half in each color. Before class, you will need to cut the hook off a wire hanger and bend the remaining wire into a circle. Make a hook on one end of the wire (so you can hang it later) and leave the other end open. Then after your students have painted the clothespins and allowed them to dry, string the clothespins on the metal ring alternately with green and red wooden beads. You will want to string the clothespins through the wire circle between the two wooden “arms” of the clothespin so the pinched end faces the outside of the circle. These will hold the cards in place around the outside of your wreath. Finish your wreath by bending the open end of the wire around the end with the hook and adding a large red bow in front of the hanging hardware. As your students send or receive greeting cards, encourage them to bring the cards in and add to the class collection. When your students have free periods, they can remove the cards and read the messages that are printed inside of the cards and then replace them on the wreath. Your students will be getting reading practice as they enjoy the season’s greetings! 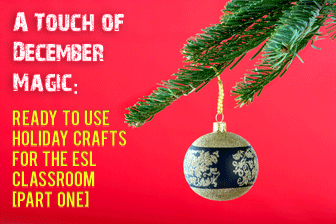 Holiday crafts can do more than satisfy an art requirement for your class. 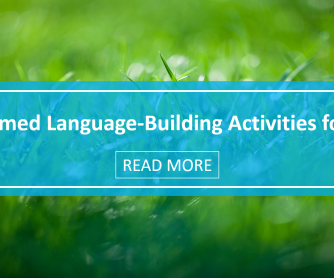 They can serve as useful language teaching venues for your ESL class. Not only that, they are fun for everyone in class. So get out the glue and glitter and have fun making, sending and collecting holiday cards this winter.